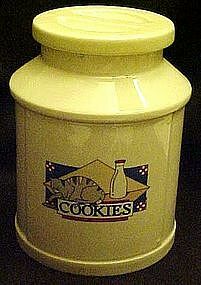 This Teleflora cookie jar is the shape of an old fashioned milk can and has a cute design if a tabby cat, with a milk bottle. Measures 8 1/8" tall and is very nice other than a small chip in the top rim. 1984.